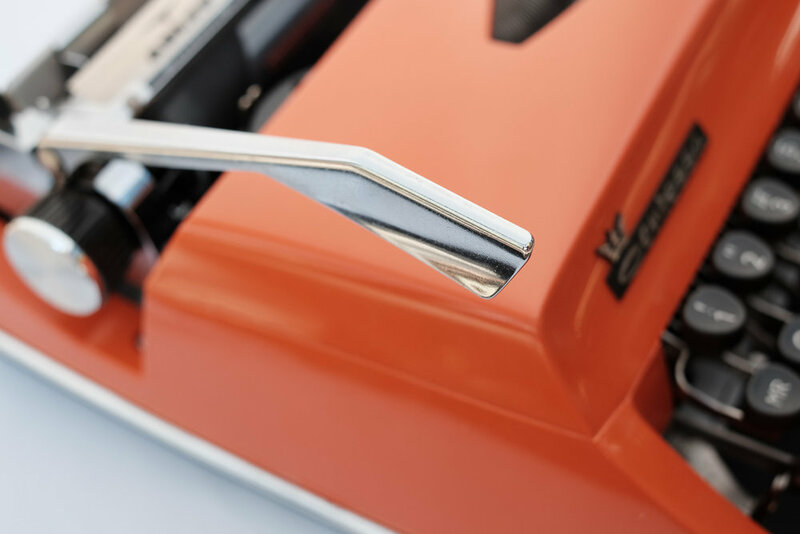 The Adler Contessa is a lovely manual portable typewriter from the early 70's. It came in several colors, shown here in a deep orange that really shows off its clean, swooping lines very nicely. 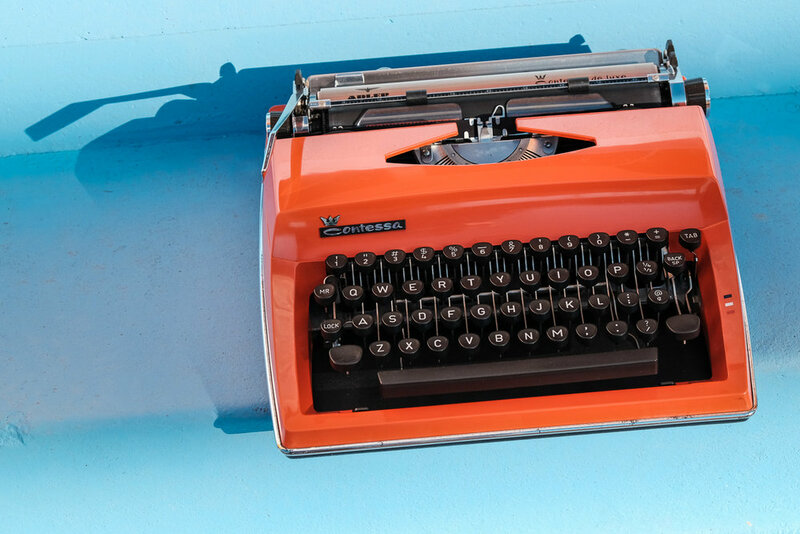 Likely a reaction to the Olivetti Valentine launched a couple of years earlier, as well the design trends of the day more broadly, the Contessa holds its own and doesn't come across as a knock-off. 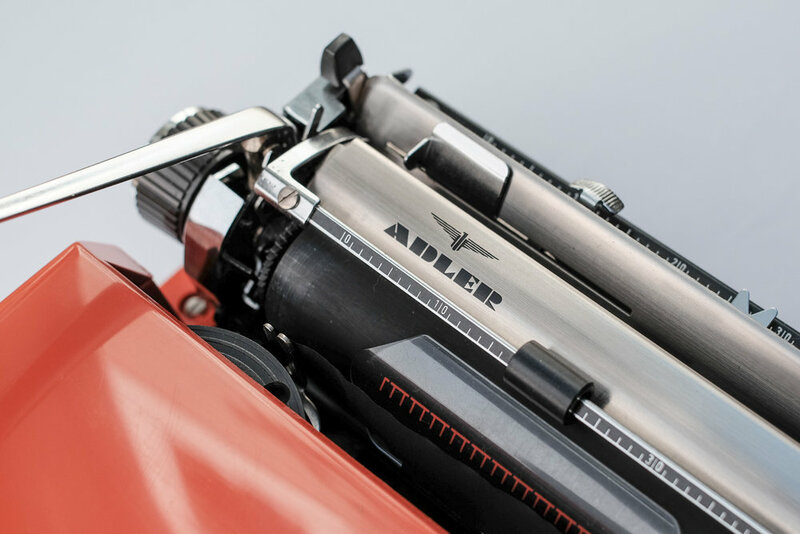 Adler is a German brand that was the first to mass-produce typewriters in the country, starting in 1898. The Adler Company started out in 1886 making bicycles, automobiles and cars, and after acquiring some American patents on early typewriter mechanisms, began building them with great success. There's very little on the web about the Contessa specifically, which was produced from 1971 to 1973, and no information about who designed it. Putting the Contessa and Valentine side by side one could be excused for reversing their countries of origin. The Contessa is from Germany yet has the curved sensuousness and brighter personality one typically associates with Italian design. Meanwhile the Valentine, which does hail from Italy, is relatively stoic and rectilinear. Even the Adler's name - Contessa - is of Italian origin. While the Valentine is more unusual in its form, and more architectural, the Adler Contessa may come from the land of precise engineering but it has the uninhibited flamboyance of a Ferrari. This example belongs to David Hoffer, who lent it to be photographed (back in the fall as you can tell by these photos). 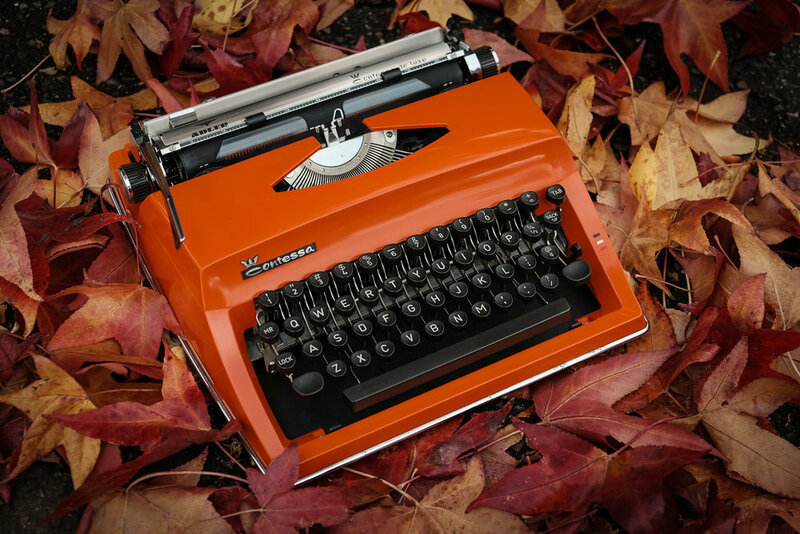 The Autumn leaves really work well with the rich, bright orange of the glossy plastic case. 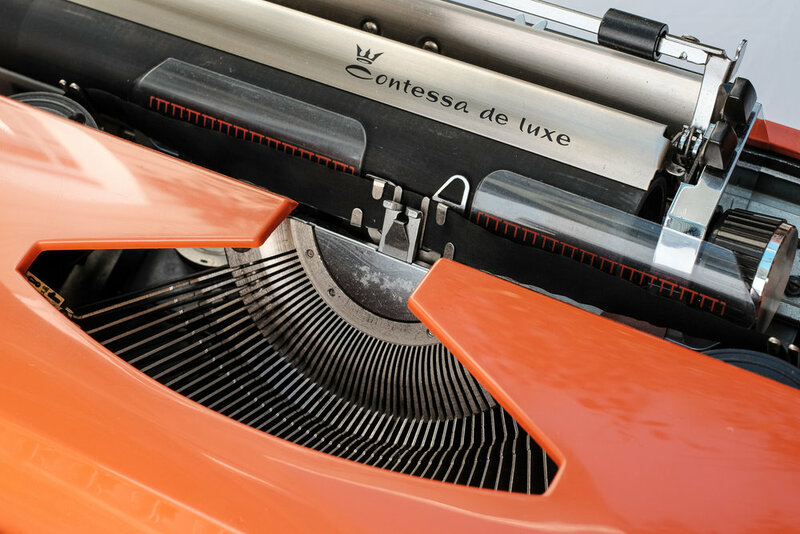 The metalwork on the Contessa is not all basic bright chrome, but much of it has a beautiful brushed gunmetal color that works very well with the orange, and which adds a layer of depth and interest to the overall design. Rather than basic glossy or matte finish, the key-caps have a rather deep swirled pattern on them that almost looks like fingerprints etched into the black plastic. The kinked chrome lever is quite elegant and rises up dramatically, but in use that angle and rise make it a little awkward to swipe at quickly. 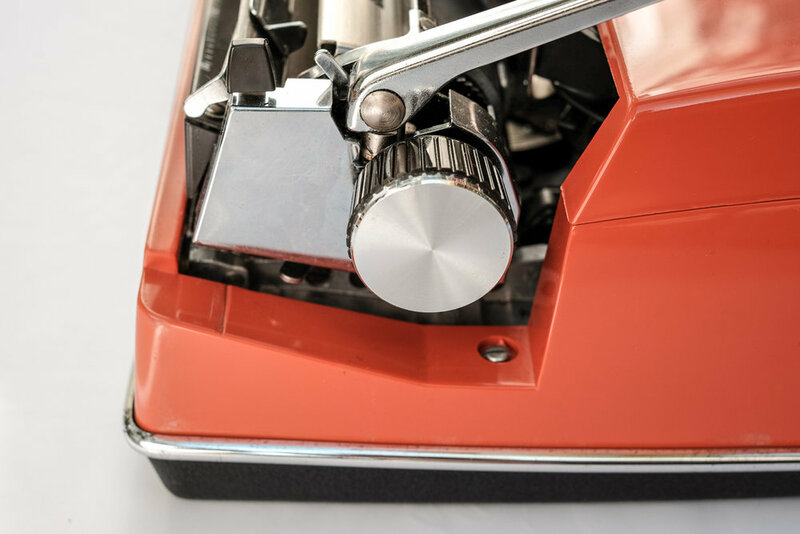 The platten knobs are fairly meaty for a small portable typewriter, making it easy to spin paper in and out. The knobs look borrowed from another machine, however, as their rather utilitarian design doesn't fit with the curvaceous body. The travel case for the Contessa (not photographed here) is similarly dull and utilitarian, a black, heavily textured affair. 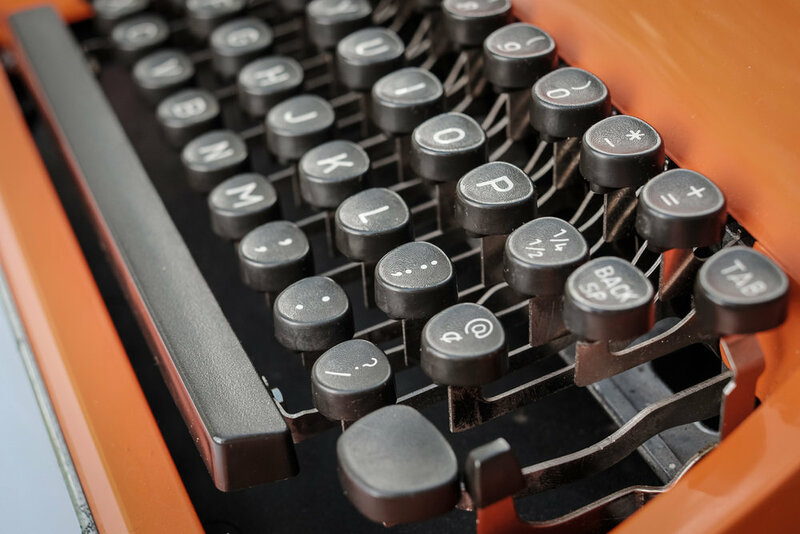 Unlike Olivetti's attention to detail throughout what would today be termed the end-to-end user experience, the Contessa lacks the dramatic presentation afforded the Valentine with its matching slide-out case. In the end, it's the perfectly judged flamboyance of the Contessa that makes it such an attractive piece. No doubt that beautiful shade of orange - a color you just don't see in today's world of monochrome gadgets - has a lot to do with that. But the poised stance and the tautly curved lines and surfaces all add up to a bright personality that you can't help but love.